Wolfsbane is captured by a supporter of Farnoq Dahn. An unconscious Wolfsbane is found in the Trans-Sabal desert by Jolel, a fervent believer in Farnoq Dahn, and his sister Sandah. Meanwhile, Quicksilver searchs for Wolfsbane while the rest of X-Factor, searching for Havok, missing since the blast that took out the Hulk, encounters members of the Pantheon. Meanwhile, a bound Wolfsbane awakens inside Jolel's house. He intends to hold her for Farnoq Dahn, and though Wolfsbane insists that she was called in to help by Dahn, Jolel remains convinced she's some kind of demon that Dahn must deal with personally. As X-Factor battles the Pantheon, Quicksilver reaches the city where Rahne is being held just as Prometheus of the Pantheon attacks hims. Wolfsbane manages to escape from Jolel's house to help Quicksilver, but Jolel catches up to her, threatening her with a knife. 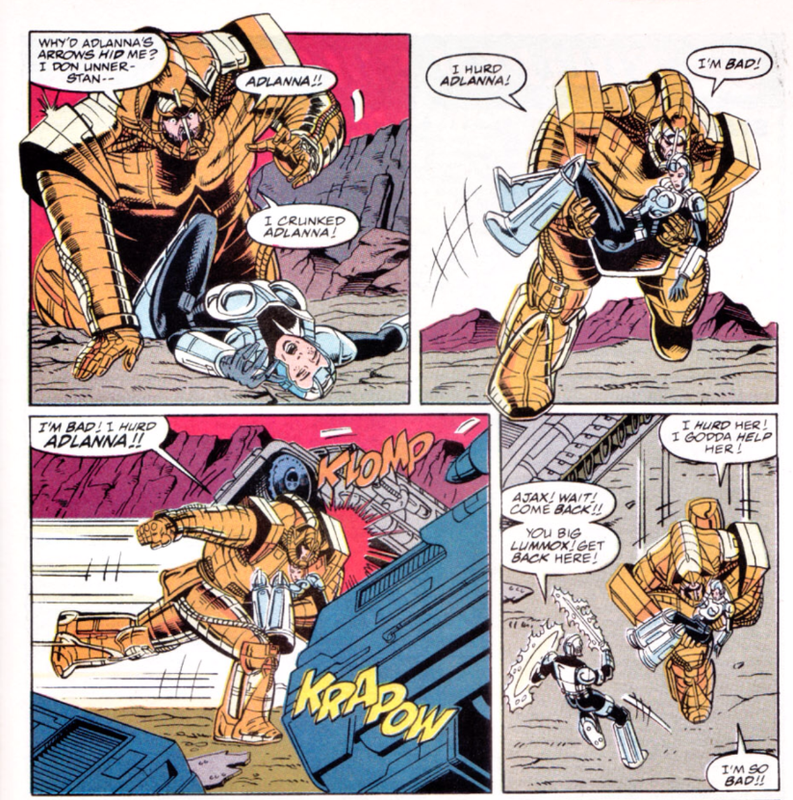 However, Sandah intervenes, knocking out her brother and allowing Wolfsbane to escape. But when Jolel comes to, he kills his sister, to Wolfsbane's horror. Though he insists it was an accident, an enraged Wolfsbane attacks him. She then emerges from his house and meets up with Quicksilver, telling him to get her out of the place, insisting that she's going to burn for what she did. This issue continues the "War and Pieces" story, picking up immediately after Hulk and Havok triggered an explosion at the end of Hulk #391, and following up on what happened to Wolfsbane after she was kicked away by the Hulk in that issue. The story concludes in Incredible Hulk #392. Having read this issue many times without reading any of the corresponding Hulk chapters, this represents my first encounter with the Pantheon, and I think I may have never held them in much esteem largely due to the presence of Ajax in this issue, who is apparently a big dumb man-child in a suit of sophisticated armor who talks in a baby voice. I pretty much thought "if this guy is on their team, how good could it possibly be?" Larry Stroman takes this issue off, with Tom Raney and Kevin West filling in. 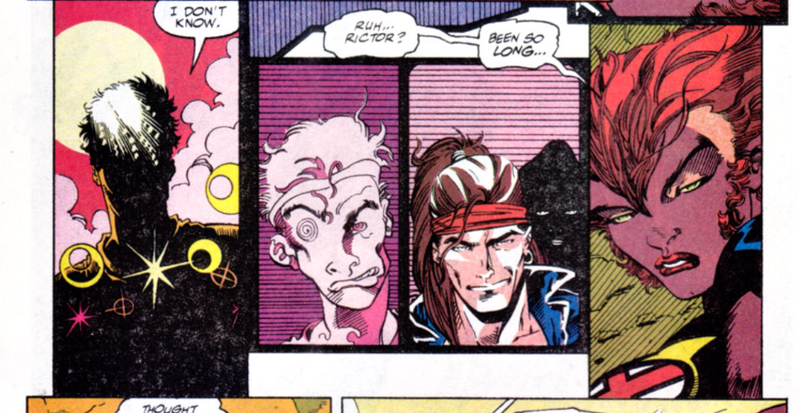 Some pages look downright Stroman-esque, but I'm not sure who drew what between the pair. The Statement of Ownership in this issue lists the average sales per month in the preceding twelve months as 265,367, which is right on pace with the same number from the previous statment (268,307 average copies). But the the issue nearest the filing date is listed as selling 392, 125, a huge increase from the previous number (228,800 copies). Presumably, this is due to the new direction of the series and the added publicity of the linewide relaunch, gaining the series an increase of over 100K copies sold. 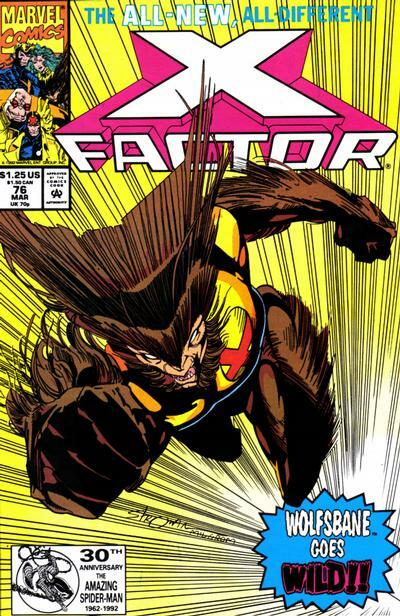 X-Factor at this time may not be the buzziest of the X-books, lacking one of the big superstar artists of the time, but it's clearly doing alright for itself sales-wise, and came out of the relaunch better than ever in that regard. 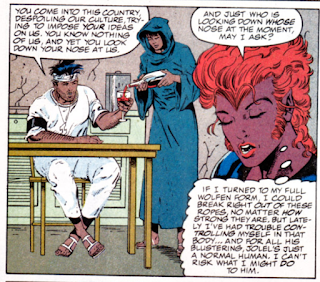 Rahne notes that she's finding it harder to control herself while in full werewolf form. She also rightly points out to Jolel that she's not American. Jolel and Rahne argue about the rights of women in their respective countries, with Jolel saying Americans don't treat women any better than his country does, but at least the women in Trans-Sabal don't complain about their lot in life, with Rahne countering that's because they're not allowed to. Upon regaining consciousness, Rahne briefly believes that she's been rescued by Rictor. To Peter David's credit, he tries his best to make each title in this crossover stand on its own as much as possible, so if you only read one book or the other you won't be totally lost (David will be chased off titles due to frustrations with how crossovers affect his plans several times, so this is clearly a sensitive issue for him), and for the most part, it works for the Hulk chapters of the story (where it can be read simply as a Hulk story guest-starring X-Factor). It works less well here, as the issue begins in media res to anyone who didn't read Hulk, with a brief caption setting up the story, which immediately highlights the fact there's other chapters to be read. The Hulk also doesn't appear in this issue at all, which, instead of helping it stand on its own, just makes it feel unnecessary to the story as a whole. 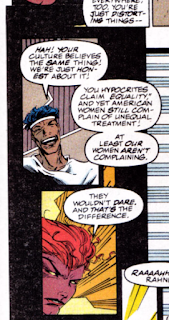 The actual plot of this issue isn't bad - putting fundamentalist Rahne in conflict with another fundamentalist will always pay dividends, especially when, as here, they're not just painted as broad types, and the ambiguity of whether or not Jolel intended to kill his sister adds some nuance to the whole thing. But reading this without the corresponding Hulk issues (as I did for many, many years), it feels incomplete despite David trying to make it stand on its own (the presence of a fill-in artist also doesn't help the feeling of it being less than a regular issue of the series), while at the same time, it feels utterly superfluous and skippable in the larger context of the story that is unfolding in Incredible Hulk. 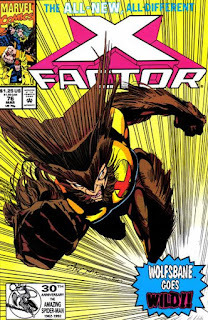 It doesn't stand on its own as an issue of X-Factor well enough, but it also doesn't tie strongly enough into the crossover to make that ineffectiveness worthwhile. Next week: X-Men #6, Excalibur #48, and Wolverine #52. 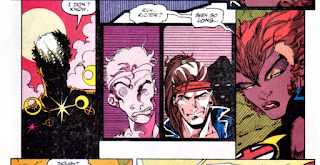 I assume Rahne’s hell-fearing remains a plot point for a while, at least. So if nothing else it establishes that? An underwhelming issue, though, for sure. It's a shame that this issue is so unmemorable considering Rahne is one of the most interesting characters in X-Factor and I've always had a soft spot for her because she must get kicked while she's down the most. With that said, I wish PAD would have let her win once in his tenure of writing the character. He only made her suffer through his entire use of her and it would be nice if someone finally used her and made her a bit sunnier after all the misery that's been lumped on her over the years.